We were invited to attend a tour of our county landfill. Interesting to see where all our “stuff” ends up and how it is recycled. It was a beautiful summer day, so we had lunch at a nearby park. And toured through a few historic buildings. . .
Like this one room schoolhouse. Don’t all homeschool mom’s dress like this each morning?!! Friday summertime fun. Hope you had some too! The deer have been getting into our garden. Apparently lettuce has not been their first choice on the buffet line. Guess what we’re having for lunch tomorrow? We read a charming book today. It’s a true story. . . “of a remarkable friendship” between a turtle and a hippo. Don’tcha just love to hug and kiss your clean kids after a bath?!! I should’ve taken a before picture with blue popsicle stickiness all over her face! I took this picture on the first day of our recent road trip. It was a rest stop in the U.P. of Michigan. Pretty nice rest stop, huh? Go HERE to check out I Heart Faces and other fun beach pictures. We were able to see spectacular sunsets on our vacation. Another of our vacation traditions is stopping by the famous Captain Sundae. We always order the Tommy Turtle. If you ever find yourself in Holland,Michigan during the summer months. . . you must stop! Even President Bush stopped by for a Tommy Turtle. Our vacation began with a celebration. We were going to surprise her at their family cottage but decided to let her know we were coming. She planned all the meals! She even made Huckleberry Buckle and a delicious chocolate cake! My sister and I had a total of 9 kids in 10 years! Only 1 is still in diapers. Their cottage has a bunk house where the older boys slept. And it has this really cool outdoor shower!! They have a Portuguese Water Dog named “Marco”. He is the easiest dog I’ve ever been around. . .doesn’t bark, doesn’t shed, doesn’t jump. But sorry guys, I’m still not ready to add a dog to our family. I know, I know, I’m just NO FUN AT ALL!! We all gave my sister charms for her new Chamilia bracelet. Check it out. . .they are so personal. I love it. My sister is now visiting by me. . . and helping me with a garage sale. What a great sister, huh? Wonderful in many ways. Birthday Blessings . . . 40 looks maaavelous on you! Happy Tuesday in July everybody! The boys had a ball “surfin’” with their cousins on the shores of Lake Michigan! Little Miss A kept her eye on the action. . .
Then decided a snack break was in order. With a satisfied tummy she toddled off to get a boogie board for herself. She seemed to love it . . .as long as she didn’t get wet! Summer vacation fun . . . from the sunshine on our heads to the sand between our toes! When my sister and family come to visit we have a few fun traditions. Two big ones are go-karting and baby back ribs for dinner. So yesterday was a very fun day. Go-karting in the afternoon. . .
GET READY. . .GET SET . . .
My sister has a great recipe. Bake at 275 for 4 hours, covered. Uncover, pour out coke, cover with favorite BBQ sauce and bake uncovered for 1 hour. Our favorite sauce is Sweet Baby Ray’s. One of our favorite traditions when we head to Michigan is blueberry picking! This year we picked a total of 55 pounds! We’ve eaten lots of them and will freeze the rest to enjoy all year long. Blueberries were prominent in Russian folk medicine, used as a preventative measure and cure for flux and other abdominal problems. Native Americans used blueberry leaves in medicinal teas thought to be good for the blood and blueberry juice was used to treat coughs. The blueberry is still prized for its antioxidant health benefits and as a laxative, as well as other folk remedies. During World War II, British Royal Air Force pilots consumed bilberries (a blueberry relative), which purportedly improved their night vision. Later studies show a sound basis for this practice because blueberries are high in bioflavonoids which are used by the rods in the eye for night vision. Blueberries rank as the number one fruit provider of antioxidants. They are also high in iron. 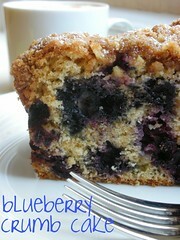 My sister makes an awesome Blueberry Coffeecake. It looks just like this. . .
Picture courtesy of “a whisk and a spoon”. It’s called HUCKLEBERRY BUCKLE and it is scrumptious! in blueberries. Dough will be stiff. Put into greased jelly roll pan or make 2 smaller pans. Mix with pie crust blender and sprinkle over top. Bake for 1 hour and 15 minutes at 350. I hope you can enjoy some fresh blueberries this summer too. We’re home from a week of road trip travels. road side rest stop on our first day of driving. Beautiful scenery on the shores of Lake Michigan. It’s great to go on vacation. I look forward to posting our highlights. But now it’s time for. . .
and oh, that’s right. . .
and plan for some meals. Or maybe take a nap. Vacations are fun -- but tiring, ya know? For the first time this summer we took the boat for a spin. Our trusty 25 year old Sea Ray. . . Turned over like a charm! Mr. C enjoyed taking pictures this evening. All my “chickens” are back in the nest. Another very positive camp experience. The sun sets on a beautiful summer day in July. Tomorrow begins with thoughts of packing for a family vacation on Thursday. Oh, the fun of packing, huh? Yep, that’s right. . . That’s what we’re doin’! I enjoyed being raised in Los Angeles, California. After marrying 22 years ago, I have come to love and appreciate the benefits of living in a small town & experiencing all 4 seasons in the woods of the midwest. My loving outdoorsman husband and I are honored to be raising 5 active boys and 1 little princess, ages 4 to 14. Home is where my heart is. I home school, home cook, home clean, home organize, home fix, and home decorate. I need to lean on my Heavenly Father every day, seeking His wisdom, His guidance, and His patience as I follow the paths he lays before me. "Trust in the Lord with all your heart and lean not on your own understanding, in all your ways acknowledge Him and He will make your paths straight."